First off, let me say that author Frances Hunter now has a fan for life. Now that that’s out of the way, I am more than delighted to give a glowing review for The Fairest Portion of the Globe, a novel about Meriwether Lewis and William Clark, before their history making journey through the West. Hunter’s novel is set in 1794 when the two young men meet at Fort Washington; it doesn’t take long for them to develop a tight bond amid the machinations of the French, the Spanish, and their own army as the struggle for control of the Mississippi River explodes around them. Clark, living in the shadow of older brother George Rogers Clark, finds himself prisoner of the Spanish; Lewis, young and headstrong, forges forth on a rescue mission with disastrous results. Along the way, we also get to know Clark’s sister Fanny, French botanist Andre Michaux, General Mad Anthony Wayne, and even a young William Henry Harrison as the novel moves from one larger than life personality to the next. This novel is so sweeping and grand that it’s almost impossible to describe. Hunter has done the research fully and the story reflects that, yet the storyline is never bogged down by too much information. Indeed, the characterizations of the historical figures are so vivid, so richly layered, that they literally leap off the pages while propelling this complex tale forward. There is humor and tragedy; there is proof that government has always been slow and overly burdened by political policy. I came away with a much clearer sense of the way our great country was explored and settled, and the price so many paid, including the Native Americans. Above all, I came away with feeling that Lewis and Clark were real people, not just names in a dusty old history book. The novel delivers such smiles frequently (“He’d been warned to expect coldness from the American temperament,” we’re told of a French visitor who’s just been presented to George Washington, “but had anyone checked Washington’s pulse lately?”), but thankfully, there’s much more to it than a little costume irreverence. Hunter has crafted a well-researched, fast-paced, and incredibly lively novel of frontier war and intrigue in 1793 Louisiana, as Jefferson and his various agents seek to wrest the territory from the control of Spain using any means necessary—including two young officers who are just beginning to forge the friendship that will become the famously ampersanded Lewis & Clark. American settings are unfairly dismissed by many historical fiction readers as dreary and uninteresting. If you’re one of these, Frances Hunter’s The Fairest Portion of the Globe serves as an excellent example to the contrary. Its action scenes brim with energy, and rather than present us with staid portraits, Hunter brings to life a scrappy young nation populated by full-blooded individuals chomping at the bit to explore, settle, defend, and expand the borders of their homeland. The novel opens in 1793. As France’s revolution rages overseas, diplomat Edmond Genet arrives in Philadelphia with a mission: persuade Thomas Jefferson, Secretary of State, that it’s in America’s best interests to help France wrest control of the lands along the Mississippi from Spain. Botanist André Michaux is a reluctant convert to this secret cause, but not everyone needs that much convincing. Hoping for glory and to restore his tarnished name, former general George Rogers Clark signs on with the French army, persuading many of his fellow Kentuckians to follow him. It’s an easy decision for most, given that Spanish control of New Orleans inhibits trade (and the delivery of fresh supplies) up and down the river. Most of the scenes play out at Fort Washington near Cincinnati, where an expert marksman from Virginia, Ensign Meriwether Lewis, and his superior officer (and George’s much younger brother), William Clark, become acquainted in surprising circumstances. Their friendship grows as they’re drawn into the conspiracy, and neither is sure where their commanding officers’ true loyalties lie. In this isolated frontier outpost, each man has his own definition of patriotism, and it’s not at all clear which man – and which country – will come out on top. Other well-rendered portraits include that of “Mad” Anthony Wayne, an aging rascal of a general determined to keep the peace at all costs, and the Clarks’ tormented younger sister, Fanny, married to an abusive man. We also get a firsthand glimpse of Captain William Henry Harrison long before his very short-lived presidency. Here, he’s a priggish officer who spouts quotes from Cicero and Shakespeare and takes pride in being the only man to understand his own jokes. While entertaining, it’s his later actions (as well as his romantic elopement) that save him from becoming a parody of himself. Conspiracy, revolution, betrayal, adventure. This huge historical novel has it all, with even a little romance included. Set in 1793, the American Revolution would seem to be over, while the French are fighting their own battles. However, the Louisiana Territory, under control of the Spanish, is a bone of contention between all factions. In a story that pits many of the big names of the day against each other, the reader is treated to a political thriller with a cast of characters that includes Meriwether Lewis, William Clark and his brother George Rogers Clark, James Wilkinson, the highest placed traitor in American history, Thomas Jefferson, botanist Andre Michaux, and, most importantly, Citizen Edmond Genet, who seeks political asylum in America. An incendiary personality, within a short time Genet manages to provoke Great Britain and Spain, weaken the new American government, and nearly cause another war. Basely closely on known facts, you may never look at America’s early years in the same way. Written by a team of sisters, Mary Clare and Liz Clare, under the name of Frances Hunter, the book is a masterpiece of research and writing. Everyday minutiae abounds. Who knew the French carried such influence in the states that Americans greeted each other with the honorific “citizen”? Too often our history books give us only the dry, uninteresting facts of how the women and men coped with dangers and hard times as they worked and fought to develop the New World; leaving us wanting more and looking for more. Frances Hunter goes one better and gives us just that—giving us the ‘what is, or what might have been.’ Opening windows to the lives and sagas and giving realism to the men and women who struggled to explore and free the land that is now the home to millions of free Americans. In her book The Fairest Portion of the Globe, Frances allows us to go along with the young Meriwether Lewis and young William Clark as they struggle with the deception and fraud formulated by their commanding officers and the political leaders of America, Spain, and France. Freshly released from the strangle-hold of Britain’s clutches, the New World now must try to free itself from the greedy, money-grubbing claws of Spain and France. Lewis and Clark find themselves as pawns in a game of intrigue where the open water-ways of the mighty Mississippi River and men’s loyalties can be sold to the highest bidder. A tug-of-war ensues between Spain, France, and politicians of the New World as all sides vie for coveted prize. You will be witness to the lives of two young men and their families as they unfold behind the scenes in this gripping tale of a roughed and beautiful young country just beginning its journey to becoming a great nation—a nation where the only people you can trust is yourself and your brother, sometimes. A recent death in the family motivated me to pull out the family tree my husband and I began working on years ago. It had been a year or two since I last looked it over or given it a much needed update. I found myself reading through the names, going back through our families’ histories. One branch of my family, I can trace back to Virginia (and Germany before that) during the late 1700’s, which is the time period of Frances Hunter’s novel, The Fairest Portion of the Globe. As I read the novel, I could not help but imagine what the life of my ancestors must have been like in early America. For as long as I can remember, I have been interested in history. When I was in school, I had a particular fondness for U.S. history. To this day, I still enjoy visiting historical landmarks whenever I travel. In recent years, my interest in history has taken a more broad form. I am drawn to the history and cultures of other countries, sometimes more so than my own. And yet, my interest in U.S. history has narrowed some. I find myself interested more in 20th century history. It shows in my fiction reading. I am not sure why that is exactly. Perhaps something to explore at greater length another time . . .
It’s been years since I last read a book set in early American history. When the authors approached me to review The Fairest Portion of the Globe, I felt a spark of excitement that took me back to those days when I couldn’t get enough of early U.S. history. Frances Hunter is a writing team of two sisters, Liz and Mary Clare. The Fairest Portion of the Globe is their second novel, sort of a prequel to their first book, To the Ends of the Earth: The Last Journey of Lewis and Clark, but readers do not have to read one to enjoy the other. La Louisiane–a land of riches beyond imagining. Whoever controls the vast domain along the Mississippi River will decide the fate of the North American continent. When young French diplomat Citizen Genet arrives in America, he’s determined to wrest Louisiana away from Spain and win it back for France—even if it means global war. There are several story threads that run through the novel, and quite a few characters to follow, but I was never lost or confused as to what was going on. In fact, I was quite intrigued by each of the characters’ stories. My favorite, however, involved George and William’s sister Fanny. Fanny is married to Doctor Jim O’Fallon, George’s good friend and right hand man. He is the one who is able to keep George sober and has a gift for dealing with the political aspects of putting together an army. Jim is well liked and respected by the Clark family. Knowing how much her brother relies on Jim, Fanny is afraid to tell anyone about the other side of her husband, his darker, more violent side. I ached for Fanny. She was such a good-hearted young woman and yet she was trapped, feeling helpless and alone. Jim is one of those characters I was truly hoping would get what he deserved in the end the more I read about him. Andre Michaux, a botanist from France whose wife died in childbirth, was another character who stole my heart. He is completely out of his element, tasked by Citizen Genet, the French diplomat, with helping General George Rogers Clark put together an army to take against Spain. He merely wants to explore and study the flora and fauna of the New World, going further west. For me, one of the most intriguing characters in the novel is General James Wilkinson, a proud man who is trusted and respected by the Clark brothers. He has his secrets, however, and like Lewis, I never quite trusted him, unsure of exactly what he was up to. As a mystery reader who often figures out the whodunit pretty quickly, there were quite a few surprising twists in this novel. I never knew what would happen next. Well, except for the ultimate outcome. The novel is based on actual historical events after all. Even so, I learned quite a bit I hadn’t known before and even spent some time doing my own research. The novel did get off to a slow start. I am not sure that could be helped, given the need to set the story up. Once William Clark was introduced, the story picked up, and it really took off for me when Meriwether Lewis appeared on the scene. I really liked both Clark and Lewis, and enjoyed watching the friendship bloom between them. Some of my favorite types of stories are origin stories, and The Fairest Portion of the Globe related the origin of the two great explorers’ friendship and eventual partnership. Lewis and Clark are legends in American history. They’ve always seemed a bit larger than life as a result. The authors offer a more personal glimpse into their lives, as well as into the Clark family, reminding me that they were real people with real fears and failings. Meriwether Lewis is a bit of a wild card, an ensign in the army and newly assigned to William Clark. In his first introduction to his commanding officer, Lewis nearly shoots Clark off his horse (one of my favorite scenes). I confess that I developed a little crush on Lewis. He is sharp and not much gets by him. He seems like the kind of person who would make a good friend, trustworthy and honorable even if a little hotheaded. William Clark, on the other hand, is more levelheaded, although no slouch either. He is a strong leader and really cares about the men under him. He is also very loyal to his family. I felt so bad for George Rogers Clark, William Clark’s brother. He’d done much for his country, only to be left high and dry in the end. He put so much of himself into his new mission, including sobering up. Like his brother and the rest of his family, I wanted him to have some of that old glory. Yet I could also see how this new situation could end up like it did before. What if the French didn’t follow through with money and back up? It all seemed a little too shaky from my perspective, especially given what I knew about Citizen Genet from the beginning chapter. It was interesting seeing America through the eyes of the characters, discovering what life must have been like in 1794, the year the novel is set. The beauty of the land, all that open space, the hardships the people endured, and the life a soldier led (The very thought of picking maggots out of my food turns my stomach). There was one passage in particular that had me running to my computer to do a little research. Lewis, at one point in the novel, is reading a book and, from the description, I knew it had to be a real book. While we can’t really know if Lewis ever read that particular book, just from the descriptions of his character–his curiosity and his love for learning–I imagine that he very likely would have enjoyed reading. And when books are scarce and there’s a lot of downtime, what’s a soldier more likely to read than a popular novel? I finally broke down and e-mailed the authors asking for the title of the book since my own rudimentary search turned up nothing. That little excursion has piqued my interest in that particular book now as well. I confess that I nearly turned down the opportunity to read The Fairest Portion of the Globe. I was a little intimidated by the fact that the novel was about such prominent historical figures–silly I know. And I also worried that reading the novel would feel too much like homework. Yet, there was that spark I talked about earlier, of revisiting a time in history that I once loved and had such a curiosity about. I took a chance and am so glad I did. Frances Hunter’s The Fairest Portion of the Globe was not only informative, it was also entertaining. I got misty-eyed, I chuckled, and I even held my breath (oh my gosh, that ending! )–and that’s even knowing a bit about how history would play out. Once there was a time, at the turn of the century before the century before, when the United States was an infant country clinging to the Atlantic seaboard and just barely clawed together out of the original colonies by the stubborn valor of a handful of men. But even at that early date, twenty years after the Revolution, the far-sighted were already spilling over the Appalachians and into the unexplored wonder of those lands beyond, to the Mississippi River. Once there was a time, when having gone toe to toe with the parent nation of England, emerging victorious by the skin of their teeth, it seemed as if the United States might also take on another European power; that of Spain, which controlled the lower Mississippi. This time again, it seemed the former colonists could call on the aid of France, caught in the throes of their own revolution. This is the dangerous political milieu in which two young Army officers meet and become firm friends, stationed at a crude frontier outpost commanded by a gouty and irascible hero of the Revolutionary War, General Anthony Wayne, nick-named by his comrades “Mad Anthony” and by his sometime Chickasaw Indian allies “The Black Snake Who Never Sleeps.” Both young William Clark and Meriwether Lewis have connections of a sort – Clark’s older brother is the hero of the Revolution in the west, George Rogers Clark, and Lewis is a neighbor and admirer of Thomas Jefferson. This is a small country – everyone knows everyone else, a circumstance that is very well drawn by the author. Both young men have a passionate interest in exploring the vast and untouched country which is just opening to the United States – but threats of war and treachery swirl around them both. George Rogers Clark is planning to redeem himself with a free-lance march on Spanish-held New Orleans, aided by French funding and the reluctant assistant of naturalist Andre Michaux. And among the senior officers of Wayne’s garrison is the slippery and amoral James Wilkenson; paid agent of the Spanish, persistently undermining Wayne’s authority as commander and for what ends? As the tightly-woven plot unfolds, the question of who is gaming who, and who is set on betraying who – and will they get away with it? – become ever more urgent. Woven into this tangle are such disparate characters as Clarke’s family, especially his sister Fanny and her brutish husband, fascinating details of the natural world, folk-medicine, and military practice and custom of the time. In 1793, Edmont Charles Genet arrives in Philadelphia, Pennsylvania, as the Minister Plenipotentiary to the United States of America. Intoxicated by the warm welcome of the locals that seem to hail him as a hero of freedom, he soon decides that he is less impressed with President George Washington, who seems a bit too… non-republican, let’s just say, for his liking. At any rate, Citizen Genet is more concerned with a greater mission: to free Louisiana from the Spanish tyrants and deliver it to France, surely the center of all that is good and what not. Citizen Genet has no ally in President Washington, but the Secretary of State, a Mr Jefferson, privately agrees with him that having freedom of access into Louisiana would be a great thing indeed as the strategic location of that place will be great for trades and all. However, America must remain neutral on all appearances – anything that goes wrong will be blamed squarely on those involved openly in the plot. Several players are drawn into Citizen Garnet’s plot. We have George Rogers Clark, a troubled former General in the Revolutionary who hopes that he will pull off a heroic stunt to redeem himself. His younger brother Young Lt William Clark will eventually befriend a man called Meriweather Lewis (who are also featured in the author’s previous effort To The Ends Of The Earth). They and several other secondary characters will find their lives changed as they find themselves knee deep in Citizen Genet’s grand plan to further the glory of France. The writing in this book is definitely top-notch, with a well-balanced sprinkling of humor amidst fast-paced action scenes and quiet scenes of heavy emotional drama. I am not familiar with the actual history of these events, so I can’t vouch for the historical authenticity of the story. I can say, though, that is an interesting and entertaining historical fiction. I especially find Citizen Genet’s portrayal intriguing – he comes off as a buffoon at times, but there is definitely a calculating sharp mind in his head. As for the others, they are likable types with various degrees of angst. I still feel that the author is better at creating male characters than female ones, as the principal female character comes off like a one-dimensional martyr more than anything else, but still, there are plenty of entertaining males to go around, heh. Here is what I suggest – read this book first before reading the author’s previous effort, because then you will get a well-written fun ride detailing the chronological development of the relationship between Clark and Lewis. Written by a sister team, Mary and Liz Clare, who write under the name of Frances Hunter, this meticulously researched book is set in a United States where Spain still owns a great deal of the south western territory. Citizen Genet, diplomat and revolutionary fresh from the bloodbath of France, arrives in Philadelphia in 1793 to convince George Washington that he must fund an expedition to claim Louisiana from the Spanish and expand the territories of the United States, to the benefit of France of course. Genet begins his search for soldiers by blackmailing Andre Michaux, a fellow Frenchman and botanist to act as his spy, and impatient with what he regards as Washington’s anti-revolutionary feelings, he finds an ally in Thomas Jefferson, who warns him that if his mission fails, the US Government will deny all knowledge of their endorsement. Nothing changes much does it? George Rogers Clark, the washed-up hero of the Revolution, is the commander of Genet’s renegade force, and General “Mad Anthony” Wayne, who discovers his enemies are a little too close for comfort. There are also two young soldiers; Meriwether Lewis, who comes through unscathed from a courts martial, and William Clark, who dreams of claiming the Western territory for the United States. Both men are faced with the awful truth that they are the instruments of those who want to destroy it. I am unfamiliar with this early US history, so there was a lot to take in regarding the politics and the disparate sides fighting for supremacy. [Not to mention sorting out the two Clarks]. This novel is intricate, detailed and written with a masterly command of the historically famous partnership between Lewis and Clark, showing and yet not condemning both their strengths and fatal flaws. “The Fairest Portion of the Globe” uses the backdrop of the chaotic time of the late eighteenth century, where France was torn apart by revolution, and America was only in infancy. 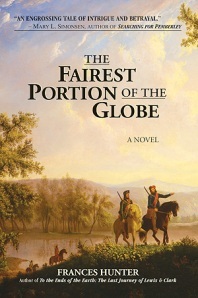 … “The Fairest Portion of the Globe” is a fine work of historical fiction that makes for a highly exciting read.